Each of the four shortlisted artists receives an international residency: this year, the Canadian nominees will travel to India, and the Indian artists will visit Canada. In addition to the $50,000 awarded to the winner, the Prize awards the three remaining shortlisted artists $5,000 each toward the creation of new work— granting a total of $65,000 to photographic artists each year. Multiple works by all four artists will be on view at the AGO in The Grange Prize 2011 Exhibition, opening today through November 27. The exhibition also features video interviews with the artists and a voting station for AGO visitors to vote for their choice in person. All four shortlisted artists will be at the AGO on September 7 for The Grange Prize 2011 Launch Party, a free, late-night public party at the Gallery. The celebration will feature a cash bar in Walker Court, snacks, a DJ set by Jaime Sin, and video interviews and live advocates highlighting each of the artists. The party starts at 7 pm, and Walker Court and The Grange Prize 2011 Exhibition will stay open until 10 pm. The Grange Prize, now in its fourth year, is the only major Canadian art prize whose winner is chosen by the public. In 2010, the partner country was the U.S., and Canadian artist Kristan Horton took the prize. 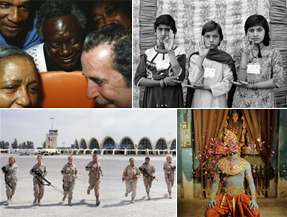 Mexican photographer Marco Antonio Cruz won in 2009, and Winnipeg-based artist Sarah Anne Johnson won in 2008, when the partner country was China. Contemporary programming at the AGO is supported by the Canada Council for the Arts. Updates, blog postings and more information about The Grange Prize can be found at www.thegrangeprize.com. Aeroplan, Canada’s premier coalition loyalty program, is owned by Groupe Aeroplan Inc., a global leader in loyalty management. Aeroplan is a long-standing patron of the arts, with a history of supporting artists and arts initiatives across Canada. Of particular significance is the company’s work, in partnership with the Art Gallery of Ontario, to develop The Grange Prize for contemporary photography. Aeroplan is committed to fostering a long-term, international dialogue about this important art form. Aeroplan has also joined the AGO in a partnership as the Signature Partner of the Photography Collection Program, supporting planned AGO activities to engage visitors with photography, including special lectures and tours. For more information about Aeroplan, visit www.groupeaeroplan.com or www.aeroplan.com.